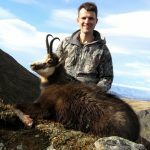 Tahr hunting, chasing the King of New Zealand’s Southern Alps. Tahr hunting encompasses everything that is hunting in New Zealand; the mountains, glassing and spotting, the planning of the climb, the climb itself, the shot and the long carry back down. We have multiple options for hunting tahr ranging from wilderness hunts from remote spike camps, to private land hunts where we hunt from the lodge each day; we will have a tahr hunting option that meets your requirements. 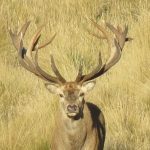 Tahr hunting in New Zealand with Lake Hawea Hunting Safaris is a must do, your ultimate alpine hunt. We have the knowledge, areas and expertise to help you be successful. Your outfitter has an extensive knowledge of tahr hunting and has been on over 100 bull tahr kills. Tahr bulls are large animals typically weighing around 220 pounds, pre rut bulls can weigh up to 300 pounds. Tahr bulls have a thick skin and muscular forelegs, generally a minimum bullet weight of 150gns is needed for tahr hunting; hard hitting .300 calibres are ideal for longer range shooting and somewhat negating bullet deviation from mountain winds. Book a tahr hunt and come and hunt New Zealand’s Southern Alps with your alpine hunting specialists, Lake Hawea Hunting Safaris. We consider bulls of around 12 inches to be trophy size and consistently take tahr bulls of up to and well over 13 inches each season, 14 inch bulls are possible. Tahr Bulls start to join with the nannies in late April and rut right through May and June and into early July. Tahr are best hunted over these months to experience the rut, the tahr bulls are also in their peak winter capes at this time. Tahr capes are good from April until around mid October. Tahr hunting over the summer months is possible but the tahr’s big bulky mane is reduced to a collar of long hair on the neck, which is comparatively no where near as impressive as the bull tahr’s winter cape. Subscribe to our newsletter to keep up to date with video hunt reports and all our other news.